Born on Christmas eve in 1166, John was the last of the five sons born to Eleanor of Aquitaine and Henry II. Eleanor had given birth to 10 children in all over a 22 year period and John was regarded as the most Poitevin of them all. He possessed true Southern European characteristics - he was short, dark and over time developed a reputation for treachery. 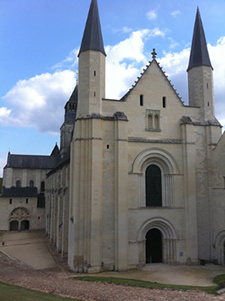 John saw little of his mother who had left him in the care of the Abbey at Fonteyvraud since 1169. 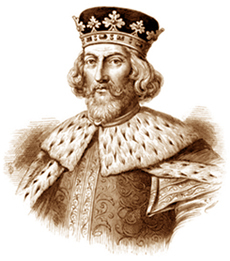 After five years at the Abbey he was taken by his father, Henry II, from Normandy to England (1174). Much has been written about his early years and how they might have influenced his development into one of the more significantly unpleasant and unsuccessful Kings of England. He had no elder brother to bond with during the years at the Abbey and the neglect by his mother stood in marked contrast to how she had treated her older sons. In addition Fonteyvraud was a "double abbey" ruled by an Abbess where the women outnumbered the men, who in turn were there to serve them. During his early years many of the Chroniclers report John as being a peevish and cross-grained youth, subject to fits of extreme temper (not unusual amongst Eleanor's sons). It is also worth noting that Philip of France was born on 21 August 1165, so within the span of just over one year the two people (Philip and John) who would do more to fight Richard I than anyone else, were born. Before we examine the character of John it is worth taking at look at his brothers. Eleanor's first son to Henry II died in infancy. Her second son was Henry the "Young King" (1155-1183) (right). He was technically the co-regent and his father tried to promote and elevate his position at court. By all accounts he was an attractive and charismatic youth who loved jousting and tournaments. However he seems to have been particularly ill advised and was influenced by troubadours such as Bertran de Born. The result was that the Young King campaigned against his father in the Limousin but having just pillaged local monasteries to raise revenue, he was laid low with dysentry (foreshadowing the eventual death of his youngest brother John with the same illness). With his health failing quickly he sought reconciliation with his father but Henry could not countenance the idea and refused, despite saying "He cost me much, but I wish he had lived to cost me more" - a clear sign that he did indeed love his son after all. The Young King died without issue. Eleanor's third son was Richard (1157-1199) who ultimately became known as "Richard The Lionheart"
(Read our dedicated page for the full story of his life). Eleanor's fourth son was Geoffrey, Duke of Brittany (1158 -1186). He had one son, Arthur 1st, Duke of Britanny, whose death at the hands of John would create a stain from which the future King was never really able to absolve himself. Some historians have claimed that Geoffrey was the most intelligent of Eleanor's sons. Whilst that may have been the case, he had no redeeming features - he was known to be treacherous and accepted evil as a fact of life. Throughout his years he seems to have held a grudge against the church and took a particular pleasure in plundering religious properties. There is no clear proof of the cause of his death in Paris and he was buried at Notre Dame Cathedral.